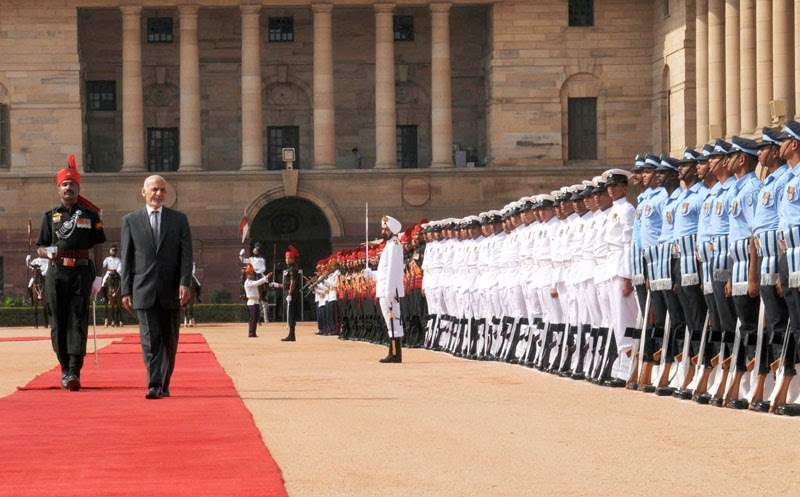 I am delighted to welcome President Ghani and his delegation to India. We are meeting in the shadow of the horrible calamity in Nepal. President Ghani and I speak for our two countries, South Asia and the world to the people of Nepal: Your courage and humanity has earned the respect of the world. And, you are not alone at this moment of tragedy and trial. We will do everything possible with rescue and relief. And, we will certainly be there when you rebuild your lives and reconstruct your homes and heritage. President Ghani and I discussed the historic efforts to rebuild his nation. We in India admire the courage and resolve of the Afghan people to seek a future of peace and prosperity. They are succeeding against huge challenges. 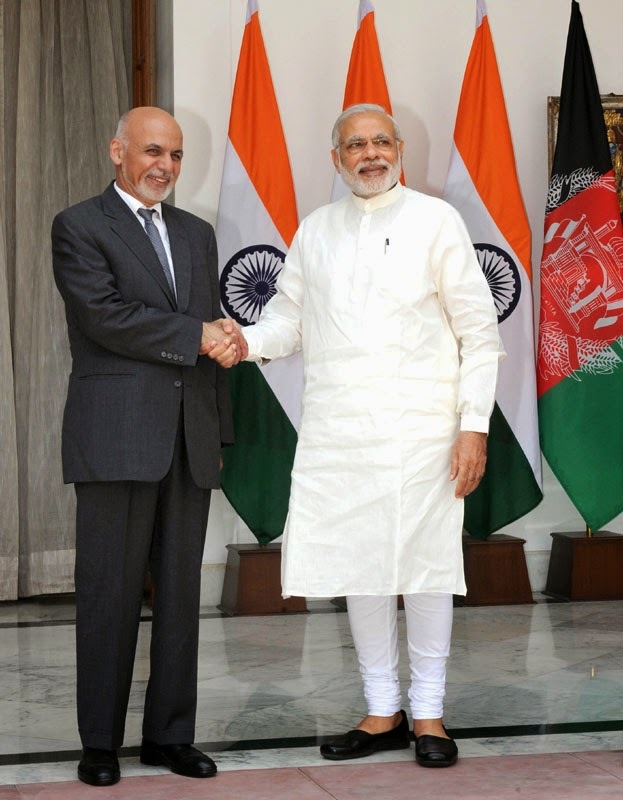 The relationship between India and Afghanistan is not just between two countries or governments. It is a timeless link of human hearts. We deeply value the friendship and the goodwill of the Afghan people. Every Indian, in turn, holds the Afghan people in the highest affection and esteem. This is why we stand with the people of Afghanistan, as they build a united, stable, democratic and prosperous nation. This comes from the responsibility of our friendship. It also stems from our commitment to regional peace and progress. Fourteen years ago, we started a new chapter in our relationship, in a new era for Afghanistan, under the leadership of President Karzai. The partnership has blossomed despite barriers of geography and hurdles of politics. We will continue this journey in partnership with President Ghani and his National Unity Government with Chief Executive Dr. Abdullah Abdullah. And, it will not be limited to the period of transition or the decade of transformation. This is an enduring commitment. The peaceful democratic transition last year is a great boost for Afghanistan's progress. It reflected the faith in democracy of the brave Afghan people and great wisdom of the nation's political leadership. Preserving the mandate and political unity will be important for the country's future. I conveyed our support for President Ghani's vision for peace and stability in Afghanistan. We have a shared interest in the success of an Afghan-led and Afghan-owned process. This should be conducted within the framework of the Constitution of Afghanistan, without the shadow of violence. It should reinforce the political, economic and social progress of the last fourteen years. And, it should protect the rights and aspirations of all sections of the society, including Afghan women. Its success requires a positive and constructive approach from neighbours, including an end to support for violence. We share Afghanistan's pain over persisting terrorism and extremist violence that destroy lives and derail progress. I thank him for our cooperation against terrorism. We are deeply grateful to the Afghan security forces, who protect our people in Afghanistan as they would their own. President Ghani shared his impressive vision for Afghanistan's prosperity, based on its talent, resources and location. 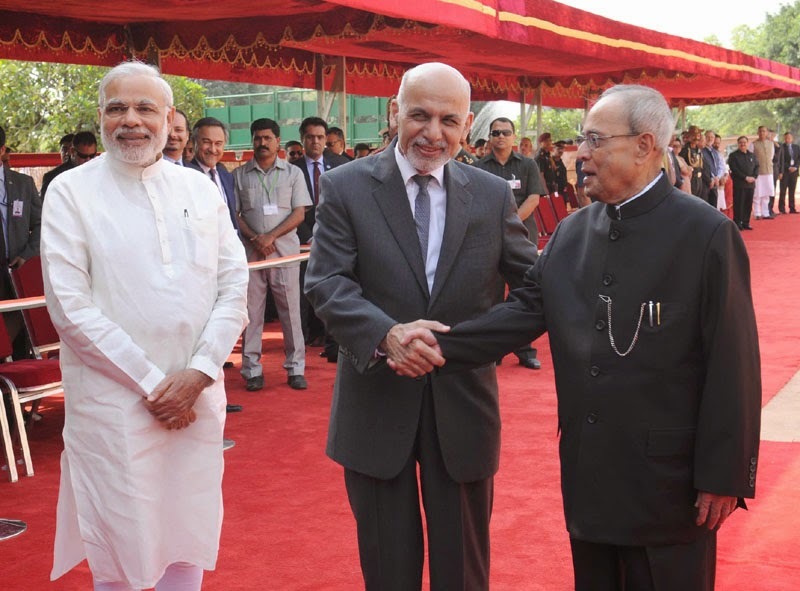 We believe that Afghanistan's direct surface link to India and the rest of South Asia and increased to seacould turn Afghanistan into a hub that connects Asia's diverse regions and beyond. We are ready to welcome Afghan trucks at the ICP Attari. We are also prepared to join the successor agreement to Afghan Pakistan Trade and Transit Agreement. This will re-establish one of the oldest trading routes of South Asia. I also reaffirmed my commitment to take the Chahbahar Port project in Iran forward. We will also quickly conclude a bilateral Motor Vehicles Agreement. We will expand our development partnership, which includes infrastructure, agriculture, connectivity, human resource development, community projects and humanitarian assistance. We will explore new trade and investment opportunities. Afghan children have a special focus in our efforts. Today, I conveyed fresh support for Habibia School in Kabul, the Indira Gandhi Child Health Care Hospital and Red Crescent Society Fund for treatment of children with congenital heart disease. We are prepared to continue our support for capacity building of Afghan security forces. I am pleased that we have delivered three Cheetal Helicopters to Afghanistan, which will add to the growing capabilities of the valiant Afghan Forces. Excellency, Afghanistan's success is a much deserved destiny of Afghan people. But, it is also vital for the world. In the troubles of our times, it has acquired added importance. India will walk shoulder to shoulder with you and the Afghan people in a mission of global importance. Your visit has added new momentum to our partnership. Thank you, Sir, thank you Excellency. The President of India, Shri Pranab Mukherjee will address the inaugural session of the National Summit on CSR (Corporate Social Responsibility) on the theme ‘Boardroom and Beyond’ organized by the CII (Confederation of Indian Industry) at Vigyan Bhawan tomorrow (April 29, 2015). As part of furthering its social development agenda, CII organizes National CSR Summits as an annual event to create a strong sustainable CSR movement. The summit sees participation of CSR practitioners, business leaders, government representatives, policy makers, media, civil society, academic and development agencies. Under this Scheme support is provided for Survey, Inventorization, in-situ conservation, ex-situ conservation / herbal gardens, Research and Development, linkage with peoples collectives like Self Help Groups (SHGs), Joint Forests Management Committees (JFMCs) etc. The Scheme is being continued during the 12th Plan. The Scheme is primarily aimed at supporting cultivation of medicinal plants on private land with backwards linkages, for establishment of nurseries for supply of quality planting material etc. and forward linkages for post-harvest management, marketing infrastructure, certification etc. Currently this Scheme is being implemented as a component (Medicinal Plants) of the National AYUSH Mission (NAM) Scheme of the Ministry of AYUSH. Central Sector Scheme for "Conservation, Development and Sustainable Management of Medicinal Plants"
Centrally Sponsored Scheme of "National Mission on Medicinal Plants"
This information was given by the Minister of State, AYUSH(IC), Shri Shripad Yesso Naik in a written reply to a question in Rajya Sabha today. The Indian Council of Agricultural Research (ICAR) has so far established a network of 642 Krishi Vigyan Kendras (KVKs) in the country. The KVKs organize different training and extension programmes for creating awareness and imparting knowledge about improved technologies and timely advisories to the farmers and rural youth including women. ICAR has also set up a Central Institute for Women in Agriculture (CIWA) to undertake research related to issues of women in agriculture. CIWA organizes various extension activities like Field Days, Exhibitions, Exposure visits, Demonstrations, Training of Trainers (TOT) etc. to acquaint women with latest technologies in agriculture. This information was given by the Minister of State for Agriculture Sh.Mohanbhai Kundaria in Lok Sabha today. A new scheme “Soil Health Card” has been introduced in year 2014-15 to assist State Governments to issue Soil Health Card to all farmers in the country, once in every three years. Soil Health Card provides information to farmers on soil nutrient status of their soil and recommendation on appropriate dosage of nutrient to be applied for improving soil health and its fertility. Apart from above, Government is implementing Soil Health Management under National Mission for Sustainable Agriculture (NMSA). Soil Health Management (SHM) aims at promoting Integrated Nutrient Management (INM) through judicious use of chemical fertilizers including secondary and micro nutrients in conjunction with organic manures and biofertilizers for improving soil health and its productivity; strengthening of soil testing facilities to provide soil test bases recommendations to farmers for improving soil fertility; upgradation of skill and knowledge of soil testing laboratory staff, extension staff and farmers through training and demonstrations. There is no proposal to utilize Mahatma Gandhi National Rural Employment Guarantee Act (MGNREGA) for augmenting farm activities in the country. *As per 2nd advance estimate released by DES. # As per 1st advance estimate released by DAC. In order to promote agriculture sector in the country, the Department of Agriculture and Cooperation is implementing various schemes and programmes such as Mission for Integrated Development of Horticulture (MIDH), National Food Security Mission (NFSM), National Mission for Sustainable Agriculture (NMSA), National Mission on Agriculture Extension and Technology (NMAET), National Mission on Oilseeds and Oil Palm (NMOOP), National Crop Insurance Programme (NCIP) etc. Under the above schemes the focus of Government is primarily on expansion of farm income, creation of non-farm income opportunities, improvement in productivity of rainfed agriculture, increasing coverage of farming areas under protective irrigation etc. The Ministry of Food Processing Industries is also implementing a Central Sector Scheme of Cold Chain, Value Addition and Preservation of Infrastructure since 2008-09 throughout the country. Timely availability of reliable estimates of area production and yield of major agricultural crops is extremely important for macro level agricultural planning. However, dis-aggregated agricultural estimates are also required for agricultural planning at district and lower level of administrative hierarchy. In the existing system, Government of India prepares all-India estimates of major agricultural crops on the basis of data received from State Agricultural Statistics Authorities (SASAs) in various States/UTs. The State Governments prepare their estimates on the basis of area enumeration in a sample of 20% villages and yield assessment through Crop Cutting Experiments (CCEs) conducted in a sub-sample of the villages selected for area enumeration. Field work of area enumeration and CCEs in the States/UTs are normally carried out by the staff of Department of Revenue/Agriculture. An Expert Committee constituted under the Chairmanship of Prof. A. Vaidyanathan observed that due to multiple responsibilities assigned to the primary worker and heavy workload on account of increasing number of CCEs, the quality of primary data and, consequently, the State/National level estimates of area, production and yield of crops has deteriorated. The Preferential Quota Sugar to EU was being exported through State Trading Enterprise (STE) subject to quantitative ceiling notified by DGFT from time to time. However, with a view to extend the benefits of export of Preferential Quota sugar to EU to the entire sugar industry in the country, the Government has now decided to liberalize the export policy in respect of export of Preferential Quota sugar to EU from ‘STE’ to “Free” regime subject to quantitative ceiling notified by DGFT from time to time. The Certificate of Origin shall be issued by the Additional DGFT, Mumbai. The exporters shall be required to furnish the details of actual exports to the Additional DGFT, Mumbai as well as to APEDA. The Preferential Quota Sugar to USA was being exported through State Trading Enterprise (STE) subject to quantitative ceiling notified by DGFT from time to time. However, the Government has now decided to change the export policy in respect of export of Preferential Quota sugar to USA from ‘STE’ to “Free” regime subject to quantitative ceiling notified by DGFT from time to time. The quota will be operated by APEDA, New Delhi as per the modalities and operational guidelines to be notified by APEDA. The exporters shall be required to furnish the details of actual exports to the APEDA, New Delhi. The Certificate of Origin, if required, shall be issued by the Additional DGFT, Mumbai. The change in the policy of the preferential sugar quota will enable all sugar industries in the country to export sugar subject to a minimal requirement of registration from APEDA or DGFT. A Notification in this regard has been notified by the Government on 20th April, 2015. The loss to the Government, due to such air crashes, assessed so far is estimated at Rs.574.42 crore in terms of value of aircraft and service property. Every IAF aircraft accident / incident is thoroughly investigated by a Court of Inquiry to ascertain the cause of accident and the recommendations of the completed Court of Inquiry are implemented. Main reasons for these accidents were Human Error and Technical Defect. This information was given by Defence MinisterShri Manohar Parrikar in a written reply to Shri RamdasAthawalein Rajya Sabha today. As per the information available, no naval base has been established by China in Seychelles. However, Government is aware of Chinese participation in development projects in the Indian Ocean Region and keeps a constant watch on all developments concerning our national security. Modernization of Indian Navy to create capability for future threats and challenges is an ongoing process. This information was given by Defence MinisterShri Manohar Parrikar in a written reply to SmtAmbikaSoniin Rajya Sabha today. The aim of Rashtriya Military Schools (RMSs) is to impart quality education and to prepare the cadets to join the Defence Services. No Rashtriya Military School has been opened since 1962 after a decision was taken to open one Sainik School in each state. Hence, there are no laid down criteria / guidelines for opening of more Rashtriya Military Schools. The scheme to establish Sainik Schools was introduced in 1961 with the primary aim of preparing boys academically, physically and mentally for entry into the National Defence Academy. The main objectives of the scheme are to remove regional imbalance in the officer cadre of the defence services and bring public school education within the reach of the common man. Sainik Schools are established on receipt of a request from a State Government agreeing to provide land along with funds for the creation and maintenance of basic infrastructure, purchase of equipment and other facilities besides scholarships for the cadets belonging to the State. The review of the performance of Rashtriya Military Schools and Sainik Schools is an ongoing process which is done by Director General Military Training in case of RMSs and Inspecting Officer Sainik Schools Society in case of Sainik Schools by way of carrying out inspections. Further, in order to improve performance, there are in-service training for teachers, workshops / conferences for Principals and other administrative staff, special coaching for NDA entrance examination, etc. The results both in the board examinations and NDA entrance examination have been satisfactory. This information was given by Defence MinisterShri Manohar Parrikar in a written reply to Shri NareshGujralin Rajya Sabha today. Defence Research and Development Organisation (DRDO) has developed sonars for Indian Navy and transferred technology to Indian Industries for manufacture and supply to Indian Navy. M/s Bharat Electronics Limited (BEL) has exported three Hull Mounted Sonars to Myanmar based on the technology developed by DRDO. Number of countries have shown their initial interest to acquire DRDO developed sonar systems. Some of the other DRDO developed products / systems, like radars, electronic warfare systems, AEW&C systems, bridging systems, missiles, torpedoes, decoys & fire control systems, etc. can be considered for export to our friendly countries. This information was given by Defence MinisterShri Manohar Parrikar in a written reply to Shri AayanurManjunathain Rajya Sabha today. Strength of the armed forces is decided with due regard to the threats in the regions and the prevailing technological environment and is reviewed from time to time. 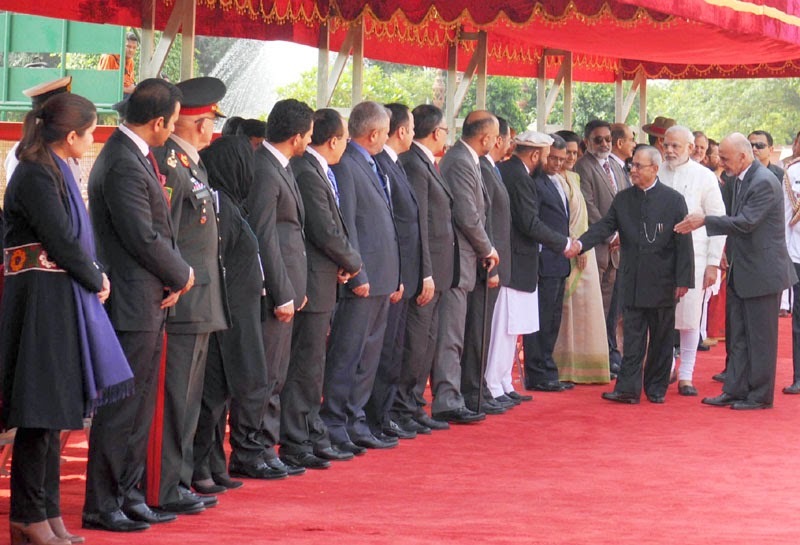 Taking into account the security environment and technology, periodic reviews are carried out and the modernization of the armed forces is executed in consonance with the roadmap laid down in the Long Term Perspective Plan (LTPP) which specified the capabilities that the armed forces need to acquire over a 15 year period. Indian Navy continuously monitors areas of national interest and undertakes regular evaluation of the maritime security environment in the Indian Ocean, Bay of Bengal and Arabian Sea. Various steps instituted in this regard include surveillance of our Coasts through deployment of Naval and Coast Guard assets, EEZ surveillance of the small island states of Indian Ocean Region, coordinated patrols along international maritime boundary and periodic deployment of Naval units to foreign shores. This information was given by Defence MinisterShri Manohar Parrikar in a written reply to Dr. V Maitreyanin Rajya Sabha today. (i) Instructions have been issued to all concerned to expedite eviction proceedings by following the due process of law. (ii) Defence land management system has been strengthened through computerization of defence land records; survey, demarcation and verification of all defence lands and periodic land audit. (iii) A committee has been constituted for monitoring progress with regard to prevention and removal of encroachment. As a result of these steps there is a reduction in total Defence land recorded as encroached by 1427 acres. As regards private land in possession of Defence Forces, regularization of such possession is an ongoing activity which is closely monitored by the Government. As per latest report, 663 acres of private land held by Defence Forces has been regularized. This information was given by Defence MinisterShri Manohar Parrikar in a written reply to Shri ShantaramNaikin Rajya Sabha today. Continuous efforts are made to keep the helicopters safe for flying and only airworthy aircraft are flown. During the last three years (2012-13, 2013-14 & 2014-15), 06 accidents have taken place involving Cheetah and Chetak helicopters of Armed Forces in which 09 defence personnel have died. Accident rate with respect to Cheetah and Chetak helicopters of Indian Air Force and Indian Army for the last 05 years is given in Annexure. Wives of Army Officers have represented to the Government for replacement of Cheetah and Chetak helicopters to avoid casualties. Phasing out of aircraft including helicopters and their replacement depends upon the national security / strategic objectives and operational requirements of the defence forces and is reviewed by the Government from time to time. This is a continuous process. *Accident Rate = Number of Accidents x 10,000. This information was given by Defence MinisterShri Manohar Parrikar in a written reply to Shri Vijay Jawaharlal Dardain Rajya Sabha today. Note:-Actual expenditure for 2014-15 is upto March (Preliminary), 2015. Utilization of Defence budget is monitored by means of the financial compilation prepared by Controller General of Defence Accounts (CGDA) which captures the details of defence expenditure incurred all over the country. The progress of expenditure is reviewed periodically at various levels in the Ministry and Service Headquarters to identify any areas where expenditure may be lagging. This helps to identify and resolve any problems in implementation of planned activities. A number of proposals for increasing the combat capacity and mobility of Infantry are included in the Long Term Integrated Perspective Plan. This information was given by Defence MinisterShri Manohar Parrikar in a written reply to ShrimatiAmbikaSoniin Rajya Sabha today.